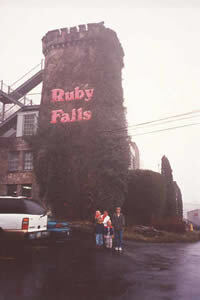 The Family at the Entrance to Ruby Falls in Chatanooga, TN. Pictured from left to right; Dook (6), Megan (3), Luz Zuluaga, Ryan (4) and Jeremy (14). 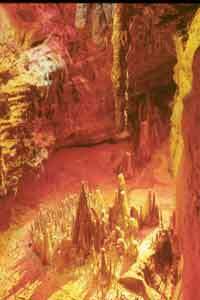 The story of Ruby Falls begins with the original Lookout Mountain Cave which had a natural entrance on the banks of the Tennessee River at the foot of Lookout Mountain. The cave was used as a campsite by American Indians, a hideout for outlaws, and a Civil War Hospital. In 1905, the Southern Railway built a railroad tunnel through the edge of Lookout Mountain, which permanently sealed off the natural entrance to the cave. 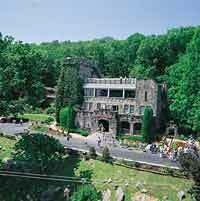 In 1923, Leo Lambert, a local cave enthusiast, formed a corporation for the purpose of opening the historic Lookout Mountain Cave to the public. 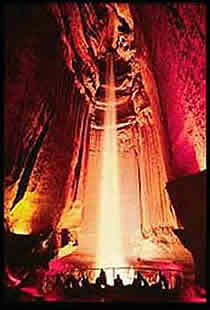 Then, in 1928, a site for an elevator shaft into the original cave was selected and drilling began. While drilling straight down through solid limestone rock, a small opening was found at the 260 foot level that measured two feet high and four feet wide. Mr. Lambert decided to explore this opening. After 17 hours, he emerged and described many beautiful rock formations and a spectacular waterfall. The entrance building was modeled after a fifteenth century Irish castle and was constructed from limestone excavated from the elevator shaft.